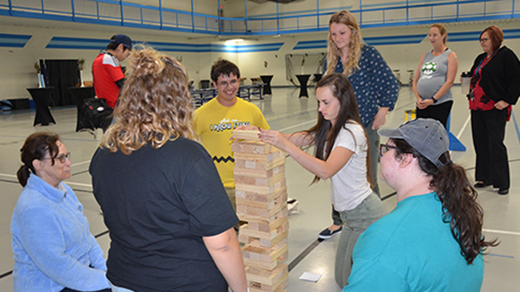 In addition to a brief presentation, "Rally for the Rec Center" participants enjoyed a number of free activities including Giant Jenga. Upper Iowa University students, faculty, staff and community members attended the “Rally for the Rec Center” on Friday, September 7. In addition to a brief presentation, participants enjoyed a a number of free games, activities, and yogurt and fruit parfait bar. UIU alumni Steve ’73 and Diane ’73 (Kinkead) Harms of West Des Moines, Iowa, have donated $750,000 to the $1.15 million improvement project. In addition to the Harms’ gift and over 150 other private donations, the University has secured a $30,000 contribution over three years from the City of Fayette and a $5,000 pledge from Fayette County. The university is contributing approximately $100,000 to the project. Recently, Andrew Wenthe, UIU vice president for External Affairs and mayor of Fayette, presented a grant proposal to the Iowa Economic Development Authority Community Attraction and Tourism (CAT) Board seeking $230,000 in funding support. UIU and other area community members who utilize the Rec Center are encouraged to consider a donation to this enhancement project. Donations can be made online at uiu.edu/alumni/give.html or be sent to the UIU Alumni Office at P.O. Box 1857, Fayette, IA 52142.